Wash rinds of 1 pound of clementines. Slice fruit in half, squeeze juice into a medium bowl, and set aside; reserve peels. Slice peels into thin (1/8-inch-thick) strips; place in a large saucepan. Add juice and 3 cups water to pan; bring to a boil. Reduce heat, and simmer. Add 1 cup sugar and 2 tablespoons thinly sliced fresh ginger to pan; simmer until peel is tender and mixture has thickened (about 30 minutes). Skim off foam; allow to cool. 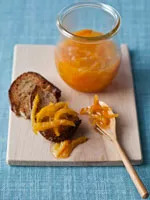 Transfer to a clean jar or container with lid; refrigerate up to 3 weeks. Serve with toast, pound cake, or warm scones.